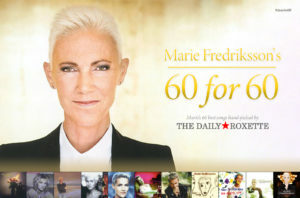 Marie Fredriksson's "60 for 60"
It's Marie's 60th birthday soon so we came up with a most splendid idea. You'll love this. HAPPY EASTER EVERYONE! Don't drink and drive! /P. Happy Easter everyone. Don't drink and drive! /P. OH YEA! THE VIDEO! Three more days to go! We've got sooooooo many pingpong-clips from you wonderful people but we'd love some more! The more, the merrier! Cheers, P.
I love this song. Written by Nils Hellberg, mastermind. /P. HEY, DON'T FORGET THE TOUR!!! Check out gessle.com for more info! /P. Five days ago, Per released his new single "Name You Beautiful." Only three days left until deadline! HEY! DON'T FORGET THE TOUR! Check out gessle.com for more info, folks! /P. Like this version very much. Old vocals, new sounds. How about you? /P. Don't forget to send in your footage for Per's new video. Send it to [email protected] and avoid filming vertically at all costs! Last day to enter is March 30. Time to pre-order. #nameyoubeautiful Preliminary release date is May 11. Help Per with the official video for "Name You Beautiful"! Acoustic version of "Name You Beautiful"!